Peaceful. That is the first word that comes to mind in describing rural scenery – no matter how apparently mundane it is. A simple dead end road may seem boring to some. 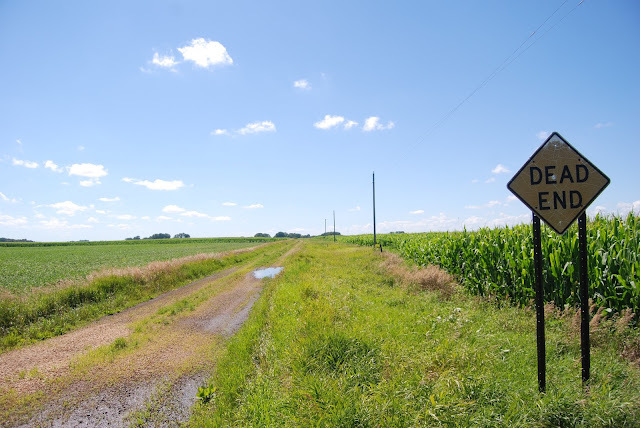 The question that I have regarding a scene such as this one I found somewhere in Nicollet County was "What was once down this now nearly abandoned road?" Was there a family who lived down this narrow gravel road generations ago? Did this road see regular wagon traffic? Did it see regular automobile traffic? If there was once a home and a family who lived down this road, when and why did they move? What happened to this hypothetical family?